Home > DeMolay, Freemasonry, freemasons, masonic, youth	> Jacques DeMolay, thou art rechartered! Jacques DeMolay, thou art rechartered! 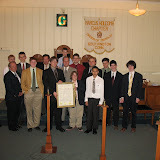 Friendship Lodge, despite being a small rural lodge (that in the last generation has become a small suburban lodge) hosts two chapters for youth organizations – one of them being a Rainbow chapter, and the other being the Marcus Holcomb DeMolay chapter. One would expect that such youth chapters to be full of the sons and daughters of the lodge members, but while this may have been true a generation or two ago, this is not the case now. Like Freemasonry itself, the number of members in the other groups wax and wane. This year, though, has seen a tremendous upswing in the membership of the Marcus Holcomb chapter; where some chapters have difficulty filling their officer’s chairs, Marcus Holcomb not only has a full line, but they even have a few new members on the sidelines. The chapter takes their name from the former Connecticut governor, who’s term was from 1915 to 1921. Holcomb, a Southington resident, died in 1932 and the members of Friendship Lodge bought his home, situated right on the town green. On Wednesday, October 25th, Marcus Holcomb had a public ceremony marking their 15th year since their re-chartering. It was attended not only by the officers and members, but also by many Senior DeMolays from Friendship Lodge, itself. Originally chartered in the 1960s, Marcus Holcomb suffered from a dearth of members and their charter was suspended in 1980. It was rechartered in 1991, when members of Friendship Lodge and various other young men sought to revitalize the chapter. Membership rose and fell again, and a few years ago some of the Advisors decided to ask the members to move over to another chapter in another town, leaving Marcus Holcomb with, at one point, only one active member. But over the last two years, that member brought in more members, and they brought in their friends and family, and once again Marcus Holcomb is thriving. I’ve been impressed with the spirit and camaraderie of these young men; they did a fantastic job in the Apple Harvest Festival earlier this month, and I’m confident that they will continue to thrive as a chapter. The process of buying a car can be extremely taxing. who know too much and constantly feel like they aren’t getting a good deal. You can get the best car at the best price by following this advice.